I have lurked here for years and thought I would share. 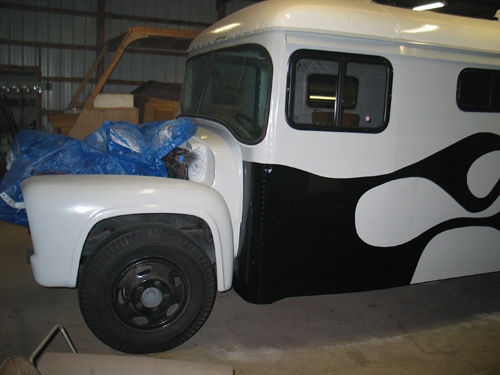 My father has a 1955 Ford conversion that he converted in the early 1960's and took it all over the US and Canada hunting and fishing. In the 1980's it was parked and just sat. About two years ago we decided to restore it, I mainly got involved with it because it allows us to spend quality time together. Below is one before picture and three pictures from this weekend. We have the luxury of working in a pole barn so I hope to have the exterior finished this winter and start on the interior this Spring. 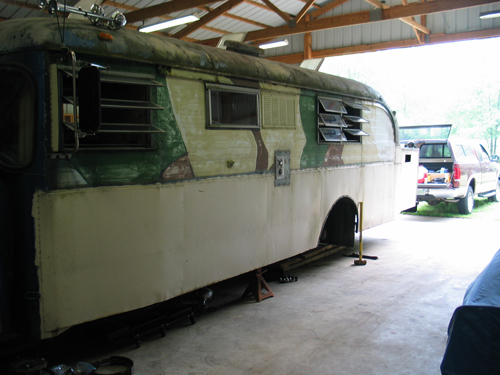 The interior was finished, but we gutted it as the floor needed new metal. The lighting is not the best and the bus looks white, but it actually has a white top and light grey sides. 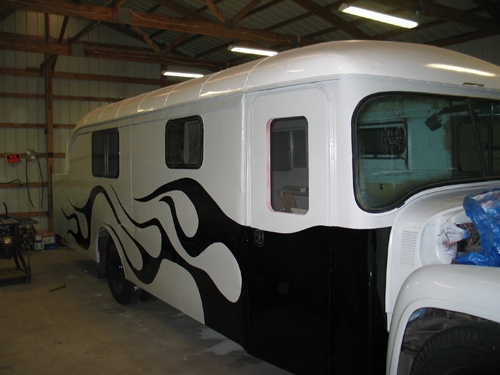 The hood and front end are now being worked on and I will paint the same style flames on the hood and front fenders. wow, she looks very nice!!!! Whats under the hood? or are you going to do some upgrading there too? Please post more pictures as you keep going. WOW, Greg! That was a mighty grand entrance for a first post! 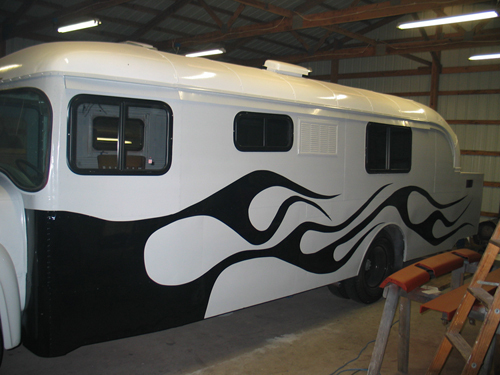 That bus is looking SWEET! Please keep us posted on the progress, and welcome to the asylum! That's 3 wow's and a drool. I think that means they like it. Thanks for the kind words. Progress is slow as I only get one day on the weekends to work on it. It currently has manual steering, on Monday I found a few old buses in a local junk yard with power steering. I am thinking of snagging one and fitting the bus with one. Last summer we put a completely new brake system on it that included a new master cylinder, wheel cylinders, and lines. Man, is that thing sweet. What's the compartment on the back? you might wanna consider lopping it off as it disrupts the beautiful lines of that thing. Need extra space? Get a trailer. somebody splain to me why a 1955 bus has manual steering aka powerful steering and a 2007 chevy aveo needs power steering? We really are pussies, nowadays. You should leave the steering alone. You'll look like popeye after a few miles!!! Wow I am still drooling. A 350 small block is easy to fix and has enough power for that ol gal. I like the black and white flames. Very cool bus. DAMN...had to look at the before and afters several times...I would almost swear they are not the same beast Being a Ford fan it loses points for the chevy motor though.